Most of the people think that Linux is just for geeks or hackers. They also think that Linux is complex and it also lacks common software. This is not true. Linux is a popular platform and it has a range of software available for different kind of things. In this article, I al listing best photo editing software for Linux. These software programs are powerful enough for working with images. See the list of best photo editing tools for artists and photographers who are interesting in working with Linux. GIMP has been available for Linux for a long time. This multipurpose image editing software is also seen as Photoshop alternative. It offers similar features. It has many options to edit photos. The software has been praised by photo editors, graphic designers, illustrators, and photographers. GIMP also supports extensions to add more features. Many Developers have also contributed to add many extensions to make GIMP an awesome photo editing tool. GIMP is also highly customizable, and you can edit the source code to add features you want. GIMP supports many image formats including PSD. So, you can also work with Photoshop files. Pinta is another nice photo editing application for Linux platform. It is similar to Paint.NET and people generally call Pinta as Paint for Linux. It comes with basic editing tools to quickly add things in photos. It offers drawing tools, adjustment filters and effects, layers editing and more. The best thing is that it supports Full history and you can undo anytime. This open source photo editing tool is also available for Mac, Windows, and BSN along with Linux platform. DigiKam is also an opensource photo editing application available for Linux platform. It helps you to edit images easily with available editing tools. It offers faster image editor with support to keyboard shortcuts. It also performs Red-eye correction, different correction graphs, blur or sharpen tool and much more. It also comes with different photo filters, resizing, cropping and rotation tools. It is also seen as Photoshop alternative for Linux Platform. It also offers tutorials to let users understand how to use this tool effectively. ShowFOTO is a standalone photo editing tool under digiKam project. It offers various standard image editing features including transformation, adding effects, filtering, metadata editing and much more. Fotoxx is also a worth to try open source photo editing and collection management tool for Linux platform. It is easy to use and lets you edit and transform photo in just a few clicks. The image can be zoomed, panned and scrolled using the mouse. It can also import RAW images and perform processing on it. The tool is interactive and fast. It offers the ability to retouch photos in enormous amounts of ways. Krita is an ultimate e photo editing software. It is the part of KDE Project but has grown to be much bigger. This opensource tool is designed for concept artists, illustrators, matte and texture artists, and the VFX industry. This tool is mainly for artists who want to have a powerful tool to create art how they choose. It also supports PSD and you can work with raw images. AfterShot Pro is one of my favorite image editing software for Linux platform. It easy to use and offers you quick editing tools. It has the ability to organize all your images neatly in folders. It comes with advanced image editing capability, raw image processing, meta data tools and more. Raw Therapee was developed for photographers who work with RAW images. It allows photographers edit raw photos by tweaking colors, sharpening focus, and cleaning up visual artifacts. This tool can export photos to JPG, PNG, and TIFF formats. It was developed with multi-threaded architecture for good performance. Darktable is photo workflow software. It is the free and open source. This tool is mainly for photographers who want to manage their photos and edit in effective ways. Photivo is a feature rich photo editing tool for Linux users. It offers RAW and bitmap file processing under 16-bit processing. It comes with the integration of Gimp workflow for import and export. It offers various photo editing tools work with photos. There are many other good photo editing tools for Linux platform. You should also try those to see how they work. 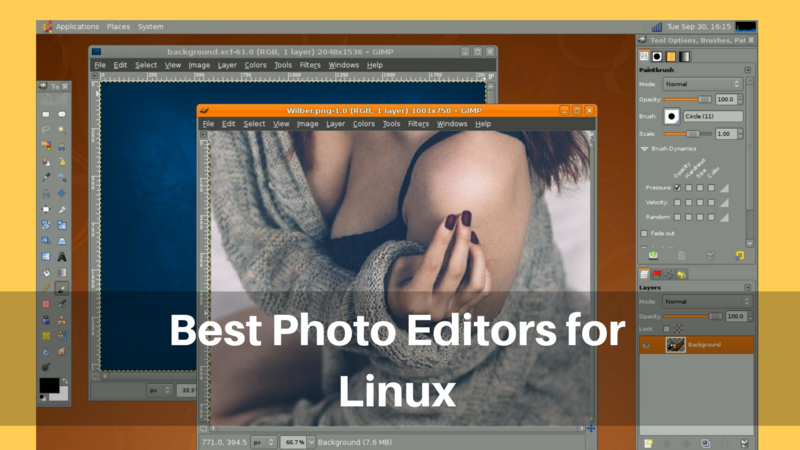 I created this list of best photo editors for Linux as per my own interest. It is not necessary that you like all the tools listed above. Tools that are designed to work with RAW formats are not for all but for photographers who know how to make best of RAW formats. If you are Linux user, you should try these photo editing tools and see the power of open source. If you have any suggestion, you can comment below.